After all, if Adam died the day before, he cannot have slaughtered those 20 children and six adults (seven, including his mother) on the following day. And the matter has been compounded by the rediscovery that all three of the major networks–ABC, NBC and CBS–reported that his body had been found accompanied by hand guns (whose numbers range from two to four), while the alleged “assault rifle” was left in the car! The reporter all confirmed that they had verified the information they were presenting with state and federal officals. But if these murders were committed with hand guns, then the justification for a ban on assault weapons on the basis of these events is non-existent. Indeed, it appears that the Sandy Hook story is turning out to be a much bigger event than it would have been had it actually been authentic. NEWTOWN, Conn. — The gunfire ended; it was so quiet they could hear the broken glass and bullet casings scraping under their boots. The smell of gunpowder filled the air. The officers turned down their radios; they did not want to give away their positions if there was still a gunman present. They found the two women first, their bodies lying on the lobby floor. Now they knew it was real. But nothing, no amount of training, could prepare them for what they found next, inside those two classrooms. “One look, and your life was absolutely changed,” said Michael McGowan, one of the first police officers to arrive at Sandy Hook Elementary School on Dec. 14, as a gunman, in the space of minutes, killed 20 first graders and 6 adults. Questions that are not explored by The New York Times include why there were no EMTs rushing to aide the victims, why there was no rash of ambulances to transport them to the hospital, why the officers on the scene were the ones to declare them dead, and why not even their parents were allowed to identify their children. Too tough for The Times, it appears. [T]hey publish some ridiculously weak response as a debunking, it utterly fails to debunk anything, but then simply because it got published by top outlets they claim the theory has been debunked. Go study just about any tragedy or big news story of the past 50 years, and you will see the same progression. [Specifically, you can study Popular Mechanics' pathetic efforts to debunk 911 Truth by this method.] But I have news for them, publishing an article with the title Debunked does not automatically mean the theory has been debunked. You actually have to make a strong argument. Blowing smoke for a couple of pages isn’t a debunking, it is just more propaganda, and most people who read these things can see that. The debunking of 911 didn’t work, because the debunking was exponentially weaker than the data it was trying to debunk.Most people now recognize that fact. We are seeing the same thing here with Sandy Hook. Among the oddities in this case–where the image of Emily on the right appears to have been added in and she is not being encompassed by her father’s arms–is the prevalence of “threes” among the fingers that are being displayed. Her mother on the left has two fingers melded together to create the image of three and Robbie himself is displaying three on each hand, while the youngest not only is showing three with her right but creating an image associated with Satanic worship with her mouth and hand. Even the other daughter, Madeleine, seems to have made a similar sign with her partially obscured hand. Without alleging a connection to the Church of Satan, which has an active chapter in Newtown, CT, it seems rather bizarre. Other sites offer more extensive and detailed analysis of possible photographic fakery, including the use of “green screens” and that Adam Lanza appears to have died the day before. In the following essay, Dennis Cimino does his best to sort out what has been going on across the country, because Sandy Hook appears to be the lastest in a series of contrived events of increasing violence, which may be designed to motivate the American people to surrender their Second Amendment rights and embrace all-encompassing forms of gun control, which has already happened in New York. The new legislation includes items such as police registry of assault weapons, limiting the number of bullets in magazines and more preventative measures to keep firearms out of the hands of the mentally ill. The proposal would target not just the sale of new assault weapons, but also those already in private hands. Current and future owners will be mandated to register the weapons, creating a paper trail even for secondhand firearms. New sales would require background checks, and the sale of assault weapons on the internet would be banned entirely. At the moment, assault weapon owners are allowed to possess ten bullets, but with the proposal, this number would be reduced to seven, with the penalty of a misdemeanor charge if caught with more than eight bullets. Those who know that the Department of Homeland Security has acquired 1.5 billion rounds of .40 caliber, hollow-point ammunition, which is not even permissible in combat under the Hague Convention of 1899; that there are more than 300 FEMA camps around the country for the concentration of dissidents; and that a Senate Subcommittee on Homeland Security and Intelligence has concluded that any domestic “terrorist threat” is either negligible or even non-existent has to ask why a department with no foreign obligations would need to acquire such a massive stockpile of ammunition of that kind–and has now requisitioned 7,000 assault rifles for its own “protection”. These are not speculations, but brute facts. Yes, we are talking about the potential of a New York guerilla war where those who participate in gun confiscation are put on “fair game” lists to be targeted and taken out. This is what is being discussed across the ‘net, on blogs, in personal conversations, on radio shows and elsewhere. Cuomo has crossed that line, and although for the record I do not advocate the use of violence to resolve conflicts, I cannot help but admit that Cuomo may very well be placing his own life, the life of his family members, and the lives of his staffers in imminent danger if he does not reverse his decision. What’s brewing right now is a kind of civil war in New York, and there are apparently all kinds of gun owners across the state who are prepared to die rather than register their firearms. Current police organizations, now under control of “Fusion Centers” run by the Department of Homeland Security, and armed with heavy military weapons, are directly in violation of this act and are, thus, in unconstitutional. However, search of Google and Wikipedia will show systematic cleansing and editing to obscure this vital American safeguard. Google, Youtube and Wikipedia have long been used by Israeli intelligence as “playgrounds” for game theory warfare against America. Dividing America and pushing it to the edge of civil war is the task of the Israel lobby led by Senator’s Feinstein and Schumer. With the support of the largest police organization, the IACP (International Association of Chiefs of Police), Feinstein’s bill is filled with “stealth” provisions for gun inspections in homes, special licensing and is aimed at disarming veterans. Enacting AIPAC’s gun confiscation law will require, not only the shelving of the constitution’s second amendment, but the first, fourth, fifth, ninth and tenth as well. With full support of police organizations, fully militarized and Israeli controlled, at the behest of key Israeli members of the US government, an undeniable effort to bring America to civil war is fully underway as we speak. While Gordon Duff (above) and Dennis Cimino (below) both posit Zionists promoting Israel as the main group wanting to disarm the US general population–both to help their wars and to subordinate the American people to politicians whom they can largely control–there are many other diverse elements in the international banking and domestic gun-confiscating movement whose interests do not always converge with those of Israel, which should be borne in mind in evaluating the situation. The gun agenda has become preeminent–and it is being driven by multiple motives. The roles of the Mossad, the CIA and DHS have become increasingly difficult to sort out, where even our best efforts may fall short. The goal of gun control is to reduce our ability to resist tyranny! In the immediate aftermath of the Newtown staged hoax in Connecticut, many of us began to finally take harder looks at the hoaxes staged in Tucson, Arizona, and in Aurora, Colorado, to see if we could find links connecting them. They appear to have been carried out by Attorney General Eric Holder and POTUS (aka Barry Soetoro) as a calculated and nation-wide smattering of “terrorist attacks” of an OPERATION GLADIO variety, plotted and carried out to strike fear into the American public and create an hysterical response against the 2nd amendment. Their secondary purpose seems to have been to further demonize 9/11 Truth, as was evident in the closure of facebook accounts of most of the prominent 9/11 Truth figures who were involved in publicizing Israel’s role in the mass murders of 9/11, which occurred in the immediate aftermath of the Newtown hoax. What is particularly telling in the photo of Giffords with an allegedly grave head wound, nobody seems concerned. All backs are turned. In real life if you had a potentially mortally wounded person being taken by an ambulance to a hospital, every one of those people would have been focused on her. Look at them. Nobody cares. Nobody is concerned. Not one person seems in a hurry to move her to the ambulance either. You know this is a DRILL, because of the lack of concern and urgency in these people around this simulated victim or “VicSIM”. Closer examination of the stretcher that Giffords is on, is that no blood is present, and her aide who stated he had “used his own hands to pressure point stop a head wound bleed” oddly has no blood on his gloved hands at all. Neither do any of the EMT personnel transporting her to the ambulance. As many of you might know, head wounds bleed profusely yet Giffords has no blood on her except a small red patch on a rag wrapped around her skull. If the lightbulb hasn’t gone on for you yet, it should when you see photos of two of Dupnik’s elderly SHERIFF’S AUXILLIARY pretending to be VICTIM RELATIVES at the alleged but simulated crime scene. They appear to be accomplices to an act of TREASON by Clarence W. Dupnik, the Pima County Sheriff. In the case of the Aurora, CO, hoax staged fraud, we have an FBI agent standing behind the Chief of Police of Aurora, watching the Chief read his cue card in his head, while Special Agent Jim Yacone smirks in satisfaction when the Chief says he is not prepared to comment about how the shooter may have gotten into the theatre. In the immediate aftermath of this shooting hoax, we have a number of witnesses talk about at least two individuals being involved and flash-bang grenades being thrown into the theatre from different directions by two individuals. Clearly, on a day like this, no FBI agent has the right to ‘smirk’ about anything the Chief of Police might divulge, nor would there be any reason for many witnesses to talk about the fact that clearly the assault on the theatre, all staged and a hoax, came from both sides of the theatre and was carried out by more than one person. So, here again, if HOLMES was the man, who were his accomplices? We know someone came in from both sides and threw flash bang grenades into the small theatre. One man could not do that. 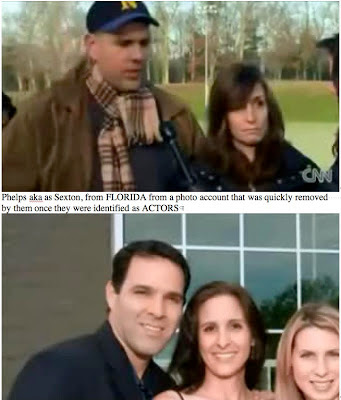 In the Newtown, CT, shooting, where we have been told 20 children and 6 adults were slaughtered, many very big and inexplicable similarities were evident, looking rather like a repetition from Tucson and Aurora, least with the use of GREENBERG’s actor cadre, the CRISIS ACTORS FROM FEMA. We have Dawn Hochsprung, who was allegedly killed shielding children from the lone gunman, giving an interview to The Newtown BEE newspaper that morning. Clearly this is not merely a misunderstanding here: no reporter would give an interview and not clarify who that was they were talking to. Yet Hochsprung was alive enough to give that interview in the aftermath of a shooting in which she died trying to shield children from bullets. Not possible. We have CNN video of SWAT team members running to the school door through a column of previously arranged orange traffic cones. Expecting someone important that day, were they? Especially since this was footage intentionally shown by CNN of a drill that had actually been staged at the school months before. A bigger clue is that the crack sealant used to seal the driveway in some of the shots was nice and shiny and fresh, but not long thereafter, it’s dull and dirty and aged. That cannot happen in one day. So we now know that the earlier drill was used by CNN (actually shot at St. Rose of Lima Elementary School, approximately 14 miles southwest of the Sandy Hook CLOSED SCHOOL, based upon information we now have that has matched up the helicopter vs. GOOGLE EARTH view and beyond a reasonable doubt shows CNN effectively had to be in on the SCAM!) in more than one NON-LIVE shot of what allegedly took place on December 14th, but clearly did not, as it was obviously a HOAX. All of it. Purposely staged to deceive the American public to grab our guns. In the helicopter footage which is now disappearing from YouTube, you see at around 7 AM a helicopter hovering over the scene with a DETROIT fire truck in the footage. EMS is staged far back at the Fire Station and almost nobody is closer than 100 yards or so from the school, and with this video being about two hours before shooting happened, it elicits many questions again about ‘how’ and ‘why’ we are able to see it on a day when we were told that a kid got the drop on a security door and nobody was forewarned that he was attempting to gain entry. Now it has been firmly established that many CRISIS ACTORS were used in Newtown, the most notable one is Robbie Parker, who is told ‘just read the card’ and has to get into character to act ‘distraught’ when moments before he is seen smirking and laughing, very much like FBI agent Yacone had in Aurora at the Chief of Police press conference. I don’t know about you, but nobody can explain away his very poor acting here, and nobody can explain the “just read the card” scenario, either. In virtually all of the follow up interviews of parents, they are all dry eyed and not puffy faced, although they are said to have lost their children. This is acting. By CRISIS ACTORS. By GREENBERG CRISIS ACTORS. Later that day we have the coroner, Wayne Carver, who is oddly out of character, telling us that all of the vicSIMS were shot using the long rifle, the .223 caliber one and that some vicSIMS had been shot more than ten times. Nobody bothered to ask Wayne why nobody was airlifted to Danbury General for possible salvation as it is not possible that nobody would survive any shooting involving 27 people, under any remote stretch of the imagination. Someone would have been found clinging to life, yet no triage existed that day to ascertain this, and someone mysteriously, not this flakey-acting coroner, had decreed that all were ‘dead’ on the scene. This again is not possible. That is not proper code BLUE protocol. You triage. You air lift. You try to save people. Not at Newtown, where they all died instantaneously and were declared DEAD by someone other than the medical examiner that day. By whom? By what authority? James Tracy has a brilliant critique of Carver’s performance here, where, if ABC/NCB/CBS are correct in their reporting (that the body was found with only handguns and the rifle had been left in the car), then what precisely are we to make of Carver’s contention that they were all shot with the Bushmaster? What is more likely: that ABC/NBC/CBS, who confirmed their report with federal and state officials, are wrong about the body having been found with only handguns in the vicinity? or that Carver–who did not even know how many of the dead were boys and how many were girls–is wrong about them all having been shot with the Bushmaster? Bear in mind, if multiple shooters had been involved, then both reports could be true, where Adam Lanza’s body was places with hand guns in the vicinity and other shooters slaughtered the children, if, indeed, any children were actually murdered at all. There is even a report that Carver himself has admitted that it was “a hoax”. United Way forgot to check the schedule before they had set up the fraudulent “fleece America” site to get money from bleeding hearts who wanted to donate to the HOAX fund to pay these crisis actors. Yep, on 11 December this DONATION SITE was set up by United Way. That’s mighty clairvoyant thinking there to be so prepped. And the brochure for telling families how to talk to their kids just happened to be RELEASED THAT DAY, when anyone in the brochure printing business knows that the laying up of a brochure and the production takes days not just an hour or two. Yet it was done on December 14th. And there is evidence it was produced on 12 December, two days before the shooting, meaning again, THIS WAS A HOAX! An act of PRE-MEDITATED HIGH TREASON. We have photoshopped photos by FEMA presumably or the FBI, showing Robbie Parker’s fake family all sitting in a CHRISTMAS CARD scene that do not make sense (above). Ironically, the same dress is worn by the vicSIM girl–although some maintain that she is actually her sister–when being photographed with President Obama, but we are told that dresses can be used by any child. By the way, all of them are smiling, possibly because that photo was taken during the DRILL months before not on the day alleged. This, in turn, raises serious questions as to whether PRESIDENT OBAMA HIMSELF is complicit in this case of apparent HOAX AND HIGH TREASON. Add to the fact that two weeks before this, Eric Holder, the U.S. Attorney General, met with the Lt. Governor and Governor of the State of Connecticut and during a press conference held by the Governor with his Lt. Governor there, they admit this freely, implicating themselves in this HOAX and LIE perpetrated on the American Public on not just this occasion, but in Tucson and Aurora. What we have is a series of HOAXES all staged by the dept of JUST US here, which were interspersed across various partsof the Continental U.S. to do two things: a.) grab guns and end the 2nd amendment. b.) demonize all independent 9/11 investigators and others who would so decry these as being ELABORATELY STAGED HOAXES USING CRISIS ACTORS! The evidence bears this out that not only was the government involved, but by virtue of CNN airing the DRILL VIDEO months before as LIVE VIDEO they too are implicated, as is Anderson Cooper and many others in MSM, including a british scumball gun grabber named Piers Morgan who demands we disarm. We have proven these HOAXES were purposely staged by FEMA and CRISIS ACTORS strictly, and that no people were truly harmed or killed in any of these events. We know that Gabrele Giffords and a Federal Judge were not shot in Tucson without blood being everywhere, yet not one EMS person on the scene there had any blood. You can pretty much rest assured that nobody died in Aurora either, that CRISIS ACTORS were again used, and per the smirking FBI agent and TREASONOUS SNAKE named James Yacone, behind the Chief of Police, this too was a HOAX and LIE. We can prove the long rifle alleged by Wayne ‘fake coroner’ Carver in Newtown was found in the trunk of a black Honda that evening, and we can prove that rifle rounds not shotgun shells were ejected onto the pavement behind that car by someone NOT IN LAW ENFORCEMENT, by the manhandling and GRANDSTANDING OF THE WEAPON that night on the helicopter video we all have. We can prove that per their own admission now that authorities have now morphed this weapon into an exotic and odd foreign made SHOTGUN when it clearly was not a shotgun. It’s not relevant any longer whether it was a shotgun, a zip gun, or a b.b. gun, because the likes of Lt. Paul Vance of the CT. STATE PATROL, has now said that both long guns that were taken to the crime scene had been locked in a vehicle and outside of the reach of a shooter who died the day before, and could not have used them because they were found in the vehicle long after any rational person could so justify this cordoned off with crime scene tape, search hours and hours later in darkness. That was not by accident. It was on purpose, filmed from the roof of the school using just enough flood lighting to make positive identification of the weapon almost impossible other than it was NOT A PISTOL. In summary regarding the weapons in the car, THEY COULD NOT HAVE BEEN USED BY ANY SHOOTER THAT DAY, so they are now excluded forever! Add to this the incredible threat by the CT STATE PATROL to charge and incarcerate ANY INDIVIDUALS DEBUNKING THESE HOAXES, and a lying snake POTUS without tears on his face, decrying we need to give up our SECOND AMENDMENT RIGHTS AS CITIZENS. We can now prove that the entire CT State emergency communications system was ‘hijacked’ and ‘unplugged’ on December 14th., 2012, per an elaborate frequency change plan implemented merely 5 hours in advance on that morning, effectively supplanting and replacing normal police and EMS with FEMA / DHS ‘shadow’ command center personnel, where it turns out that they (the HOAX perpetrators from FEMA) made one critical mistake that they hoped nobody would catch. But last night, I caught it. During the listening to the plethora of radio scanner audio recordings, I finally had a chance to hear the infamous plate run of the black Honda. I had for weeks taken for granted that others who heard it would have validated it as either fakery or reality but nobody caught the fact it is in it’s entirely, FAKE. Police and Dispatch, nation wide, use a very time honored ALPHA PHONETIC System to enunciate alpha numeric data between the officers and the dispatchers. It is different from what military use, and it is so ingrained and dyed into the wool of real law enforcement and dispatchers for a good reason. Any error can cost not only the officer his life, but potentially cost others their lives either by sending people to the wrong address or by implicating the wrong person in a crime, or missing a criminal during a CODE TEN run on the person through the system. Suppose for the record that had the officer deviated and read data to dispatch improperly, the dispatcher would have read it back with PROPER PHONETIC enunciation to the officer under any and all circumstances, not as a correction of the officer but to make it clear that to all on the circuit who are listening that they pay attention to the data readback, as many backup units in the vicinity may need that data to properly B.O.L.O. find a car they need to intercept. B.O.L.O. is Be On Look Out, by the way. So on the 14th of December, we know that 5 hours earlier, a comprehensive frequency change plan for all emergency communications in Connecticut, State Wide, got implemented. It wasn’t just a coincidence. As it would now appear, a ‘shadow’ dispatch center went into operation on December 14th., presumably run entirely by FEMA and DHS or MOSSAD possibly, because they used non trained, non familiar with the ALPHA PHONETIC protocols police use, to do radio transmissions that day, which now clearly must have all been staged for us like the rest of this hoax was. This is a strong allegation to make, but I make it now based on the way this information was transferred by clearly non law enforcement personnel, intentionally in a way that was interceptable and recorded by someone, if not wholly fed to us via calibrated feed or leak by the perpetrators of the hoax. It is pretty clear that the entire emergency radio apparatus of Connecticut was unplugged altogether on December 14th., with possibly a back channel to allow non HOAX or NON DRILL emergency information to be handled by real law enforcers and real dispatchers. As is now certified by this analysis, clearly there is evidence of circumvention just as NEADS was circumvented and not allowed to have live radar feeds from radar facilities on 9/11, but had data that was 26 seconds OLD, for good reason: that being to cull out and remove real targets that the perpetrators needed never to be intercepted, while loading the system up with pre recorded exercise radar tracks and artificial targets to confuse not just military but CIVILIAN ATC personnel on 9/11. So back to this HOAX in Newtown CT, for example, when a police officer calls in ‘A B C D’ to dispatch, he or she phonetically enunciates it as; “ADAM BAKER CHARLES DAVID” over the radio, and the dispatcher will read back the same PHONETIC information for clarification. On December 14th., the plate data was not read to and from dispatch like this at all. The way the officer and dispatcher read this data was; ‘A B C D’ AYE BEE CEE DEE’ and that is clearly not correct and NEVER EVER DONE as it is too easy to mistakenly misunderstand transmissions coded thusly. This is now a record, not conjecture, not speculation, but stuff everyone has in their possession that was disseminated and NOT CHALLENGED by Lt. Vance of the CT STATE PATROL or other law enforcers now for several weeks, had it been not their transmissions. Why is this such an important issue? Dispatchers and Law Enforcement personnel are trained and trained and trained and trained. Even in high stress environments which they train in simulations, by the way, they are ingrained to not deviate from these procedures. So it is important to point out here that the people on the radio in Connecticut that day clearly were not law enforcement or dispatcher personnel. They could not have been. They so grossly deviated in the data reads over the radio that no law enforcer or dispatcher would so deviate like that. Absolutely never. Much of these recordings clearly are indicative of non law enforcement personnel on radios. Persons without intensive training as to how to report information to dispatchers and other officers. Other people familiar with the normal POLICE alpha phonetic system also concur with my evaluation that these are not police nor are they trained dispatch personnel on these recordings. They are FEMA personnel most likely or DHS personnel, or maybe even MOSSAD agents, given the dynamic of how much control they have here in the U.S., in direct collusion with this government. They provide intelligence to the acting director of DHS, Janet Napoletano, and they are integral to most of the fusion centers in the U.S., effectively legitimizing a foreign secret police force on U.S. soil who’s sole purpose is to spy on and harass American Citizens, who, for many reasons, do not like what is going on in this hijacked by Israeli spies, nation. The 33 frequency change modification to the communications plan for Connecticut that went into effect 5 hours before the staged hoax went down, happened for a reason. It would not be unreasonable to conclude that Site 1-22 was the DHS or FEMA master control site, which was monitoring every communication related to Sandy Hook that day and make sure that no information that would blow its cover got out. We now have more proof that virtually all of this was a staged, canned, very treasonous HOAX run by the highest levels of Connecticut STATE PATROL, and FEMA and DHS who had total oversight over all of this in the nation on December 14th. 2012. Now these sweeping frequency allocations changes make perfect sense. Not unlike on September 11th, where all of the ATC to AA-11 radio broadcasts were found to be fraudulent and scripted and NON REALITY. This was no different. And now we have one more PROOF POSITIVE that this was a huge massive HOAX perpetrated on everyone on December 14th, just like Sept 11th was, and Tucson was, and Aurora was, and perhaps even the Sikh Temple shooting in Wisconsin and the Clackamas Mall shooting were. ALL FEMA HOAXES run by this corrupt illegitimacy known as the Federal Government and their eager for the money (PROJECT LONGEVITY CASH COW BRIBE RECIPIENTS). Something is desperately wrong when so many Americans cannot distinguish between the government’s FABRICATED CRISIS ACTOR fantasy and reality. We have the goods. We can prove these are HOAXES staged to grab guns. I ask you to INDICT THESE TRAITORS AND TREASONOUS LIARS, including the Attorney General, the FBI, and the President of the United States as well as Clarence W. Dupnik, the Chief of Police of Aurora, Colorado, and the Lt. Governor and the Governor of Connecticut, for taking part in these HOAXES. And, yes, every single CRISIS ACTOR who participated in these FRAUDS PERPETRATED UPON AMERICA IN THESE THREE STAGED HOAXES. Now is the time for every single American to come to grips with the hard reality, which is that our own Federal Government has become an INTERNAL ENEMY, which has been hijacked by powerful interests who will cover up any degree of mass murder, treason, and looting that is committed here, especially by Zionists who are promoting the interests of Israel and not those of the United States. Each and every one of us has a choice, which is simple: RESIST! Dennis Cimino, who has extensive engineering and support experience with military electronics, predominantly US Navy Combat Systems, was the Navy’s top EMI troubleshooter before he went to work for Raytheon in the 1980s.